Today, there is a holiday in Spain. The festivity of Mare de Déu d’Agost, also known as Mare de Déu de la Assumpció (Assumption of Virgin Mary), is being celebrated. 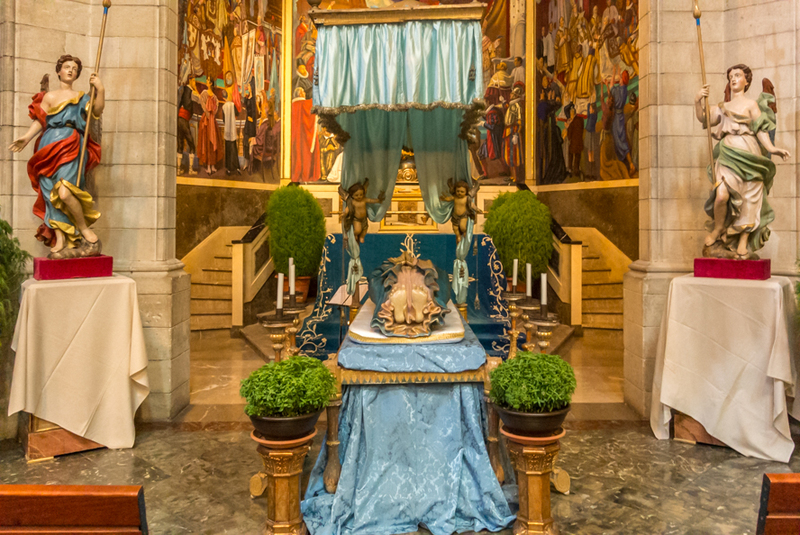 The festivity is also called Dormició de Maria (Dormition of Mary). A number of churches in Palma as well as others in the outlying pueblos offer some elaborate displays of reclining statues of the sleeping Virgin. In case you should be interested, you could consult the website of Asumpcio de la Mare de Déu, where you can download a leaflet in pdf format giving you detailed information in English, Catalan or Spanish about places and events in churches throughout Mallorca. Some presentations commenced earlier this week, others started yesterday, and some will continue until August 24th. The photo was taken at the church of Nostra Senyora dels Dolors in Manacor, Mallorca, Baleares, Spain. The date: August 14th, 2014.